In this digital age, most people rely on digital technology to perform daily activities. The emergence of information and communications technology (ICT) paved the way for better delivery of services from different organizations including the government, private sector and nonprofits to the consumption of the general public. However, digital divide still exists where some people, mostly located in the rural areas, don’t have access to digital resources. Now on its second year, Digital Strategies for Development Summit (DSDS) 2015: A Knowledge Exchange Forum for Asia-Pacific Region and Beyond aims to address this problem by promoting digital inclusion. Organized by DOST-ICT Office, the International Telecommunications Union (ITU) and the Asian Development Bank (ADB) and managed by Asia Society for Social Improvement and Sustainable Transformation, the event will be held on Sept 22-24 at Waterfront Cebu City Hotel, Philippines. DSDS 2015 is sponsored by Intel, Accenture and Microsoft. With the theme, Accelerating Inclusive Development through ICT Innovation, DSDS 2015 brings together international development partners, policy makers, regulators, telecentre operators and managers, content and services developers and providers and key players from the public sector, NGOs, industry and academia. This dynamic circle of participants equips each attendee to bring home best practices and lessons learned from real experiences on ICT innovation. Among the globally renowned speakers were International Telecommunication Union (ITU) Secretary General Houlin Zhou, Department of Science and Technology (DOST) Secretary Mario Montejo, Asian Development Bank (ADB) Director of Poverty Reduction, Gender, and Social Development Division Bart Edes, Intel Corporation Regional Director for Corporate Affairs, Asia Pacific & Japan, Anjan Ghosh and DOST-ICTO Assistant Secretary Bettina Quimson. The digital divide is particularly true in the Philippines where more than 60% of the land area has little or no access to the Internet. The Philippines was also reported to have the slowest Internet speed in the region, only faster than Afganistan. According to Undersecretary Louis Casambre of the DOST-ICT Office, co-organizer of the event; “With the existence of socio-economic disparity among the people, there is a definite call to accelerate digital inclusion through innovative solutions across all industries. On the government’s part, we launched the Free Wi-FI internet access in public places project under the “Juan Konek” digital empowerment program, the Integrated Government Philippines project or iGovPhil as well as our program to promote eFilipino towards a digitally inclusive country through Tech4ED. The role of ICT Innovations across 5 different sectors such as Education Employment, SME & Entrepreneurship, Gender Equality, Agriculture, Healthcare & Social Protection, and Last Mile Connectivity will be highlighted in this event. Some of the country’s most promising ICT innovation startups will also be presented in an exhibit that will be held along with the plenary and breakout sessions. It is hoped that this event will empower each participant to become enablers of innovations and finally bridging the gap between the individuals with low access to technology to the ones who have high accessibility. 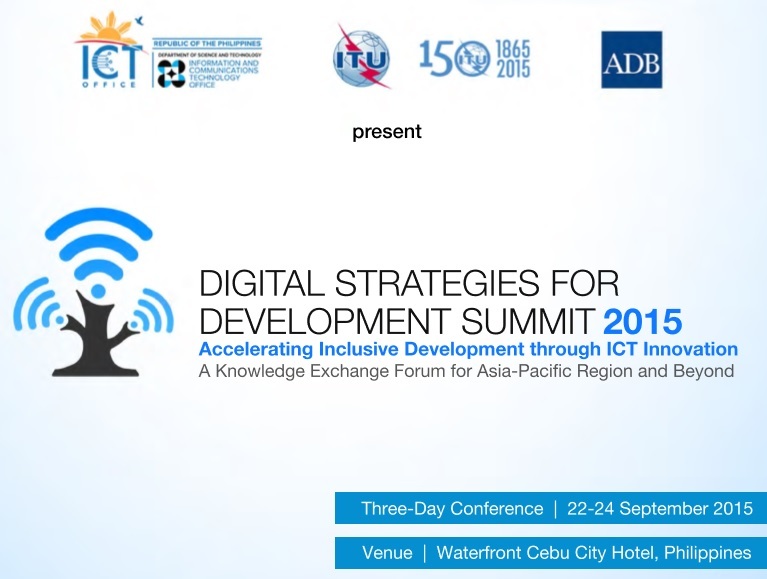 DSDS 2015 is supported by key partners such as AsianNGO, Philippine Chamber of Commerce and Industry (PCCI), Grameen Foundation, Plan International, Edukasyon.ph, Philippine Society Information Technology Educators Foundation Inc. (PSITE), TechSoup global, Cebu Chamber of Commerce and Industry, Teach for the Philippines, InfoComm Technology Association of the Philippines (ITAP), GiZ ProGED Project, National Youth Commission, Youth Sustainable Development Assembly and media partners which include Geeks in Cambodia, SunStar, ABS-CBN News Channel and Rappler.